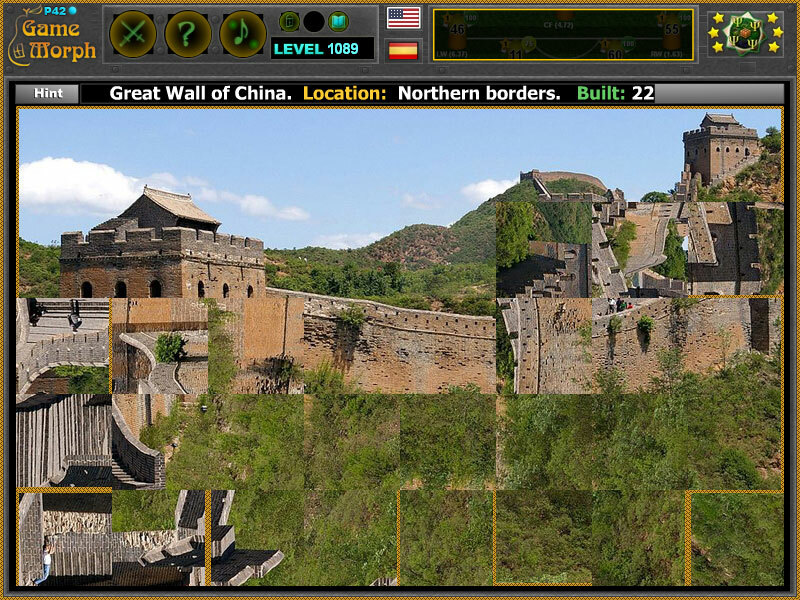 Great Wall of China world wonder in a fun online history puzzle. "Great Wall of China Puzzle" is a fun square rotating puzzle to sort 40 squares puzzle of the Great Wall of China wonder of the world. Fun online history puzzles for desktop computers, laptops and tablets, which may be played in the web browser. Wonders of the world game. How to play Great Wall of China Puzzle. This is a common square rotating puzzle. Click on the puzzle pieces to rotate them, while they fit the original picture of the Great Wall of China. Use the "hint" button to see which pieces left. Know a famous world wonder and get +1 Knowledge Level. Class subject: The Great Wall of China. From Wikipedia: The Great Wall of China is a series of fortifications made of stone, brick, tamped earth, wood, and other materials, generally built along an east-to-west line across the historical northern borders of China to protect the Chinese states and empires against the raids and invasions of the various nomadic groups of the Eurasian Steppe. Several walls were being built as early as the 7th century BC these, later joined together and made bigger and stronger, are collectively referred to as the Great Wall. Especially famous is the wall built in 220–206 BC by Qin Shi Huang, the first Emperor of China. Labels: History Games , World Wonders , Puzzles , Flash Games , Knowledge Games , Education Games , Free Online Games.